A simple square pergola which features a pyramid plastic roof. 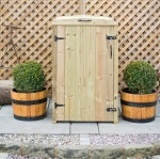 The four corners are constructed from square wooden trellis which is fantastic for growing plants and flowers such as climbing clematis, roses or honey suckle. 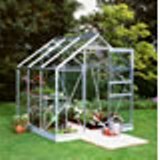 This gazebo really would be a beautiful addition to any garden and a great place to entertain or relax in. The Pegasus Pergola also comes with all the fixtures and fixings required for home installation. 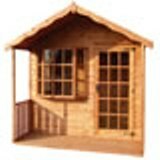 Kensington Summerhouse 1.83 x 3.05m traditional chalet style building with lots of options available.